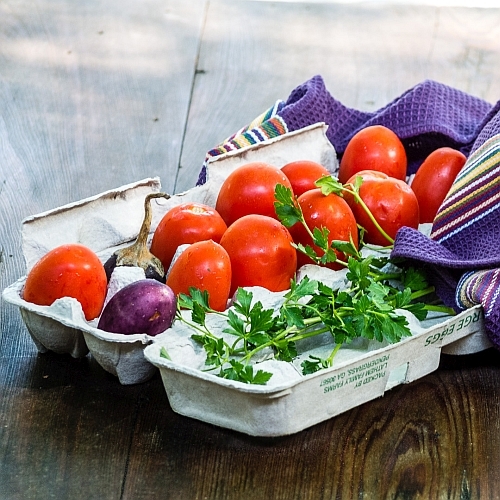 Whether you call the oval fruits of Solanum lycopersicum San Marzano, Roma, or simply “sauce tomatoes,” these are part of the spring offerings in Florida. One of the New World gifts that became staples in Old World cuisines, especially those of the Middle East and Mediterranean, the tomato stands out in the popular association with Italian food in both Italy and the Americas. Solanum melongena, the aubergine or eggplant, so called because some of its cultivars are not only ovoid but also white, was an Old Country botanical relative who’d been waiting centuries for a skillful Figaro to arrange a meeting with his rosy American cousin. That Italian introduction took place sometime in the middle of the 16th century, and it was hardly speed-dating. Over two centuries passed before the American import had achieved widespread acceptance throughout the Italian peninsula. If this hints of a multi-generational historical drama that cuts across class, ethnicity, and religion, it is. Eggplant Parm, meet your ancestors! This entry was posted in Uncategorized on March 27, 2016 by Skip. What Would Pope Francis Cook? Was it only two years ago that we first presented our recipe for Pasta e Ceci to celebrate Pope Francis’s ascension to the Papacy? The peripatetic Holy Father has covered a lot of ground since then and now he’s here, back in the New World. To welcome him, we once again offer this modest, everyday Roman dish, a heavenly combination of ditalini and chick-peas. We can well imagine that after a week of airline food and banquets, the Holy Father may be yearning for a little home-cooking. For Pasta e Ceci, Romans favor ditalini, which cook quickly within the broth of already-cooked pulses. Also called paternoster and avemarie, Our Father and Hail Mary, these short semolina tubes are reminiscent of rosary beads. 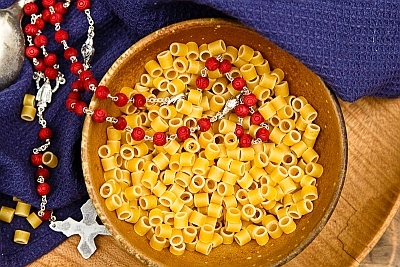 Since devout cooks often said their evening prayers while preparing supper, some families maintained a tradition of gauging the cooking of their pasta according to the time it took to recite one or more prayers! The dish is quickly assembled. Just be sure your chickpeas are thoroughly cooked before you begin. 4 Tablespoons flat-leaf Italian parsley, finely chopped. Heat a 4 to 6-quart pot over medium-high heat, then add enough olive oil to coat the bottom of the pot. Lower the heat to medium-low and add all the ingredients for the batutto. Sauté, stirring occasionally for approximately 10 minutes, or until the ingredients soften and barely begin to caramelize. Add the marjoram and a few grinds of black pepper and stir. Cook for a minute or two, allowing the herbs and pepper to begin to permeate the batutto. 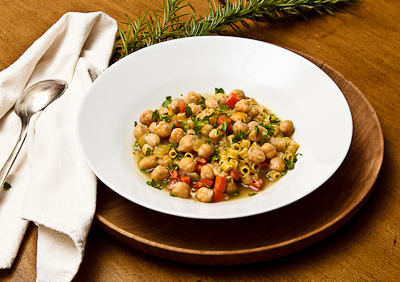 Add the drained canned chickpeas (OR the home-cooked chickpeas and their cooking liquid) to the battuto. Add additional water so that you have a total of 6 cups of liquid in the pot. Adjust the heat and simmer for approximately 10 minutes. Have your garnishes ready as the pasta will cook very quickly. Add the ditalini to the broth and simmer, uncovered, for about 2 minutes before you test one of the ditalini.If the pasta has reached the al dente state, the soup is ready. If not, continue cooking and tasting for another 1-2 minutes. Ladle the soup into shallow bowls. Drizzle a teaspoon of fruity olive oil over each portion and garnish with parsley and freshly grated Parmesan cheese. Benvenuto, Francesco e buon appetito a tutti! This entry was posted in Uncategorized on September 24, 2015 by hollychase. New Year’s Day—even beyond the implementation of all manner of resolutions—is a time to do something, or more specifically, to eat something that will bring luck for the coming year. For Italians, that means lentils with sausages. The lentils are said to symbolize coins which the diner can hope to amass in the coming year. And for poor Italian peasants and laborers, the sausage once represented opulence. 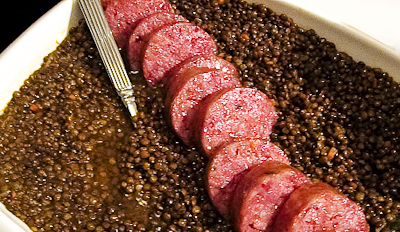 Most southern Italians eat cotechino sausage on New Year’s Day. Lavishly spiced with coriander seed, black pepper, nutmeg, mace, cloves, allspice, and cinnamon, this is a fresh pork sausage that includes those proverbial everything-but-the-squeal portions of a pig. Cotechino may very well have been the inspiration for Winston Churchill’s remark that anyone interested in laws and sausages should never watch them being made. Italians north of Rome eat a sausage similar to cotechino, but butchers stuff the meat into a pig’s foot and call it Zampone. Unable to buy a cotechino locally, in time for our New Year’s dinner, we hardly felt deprived. The sausages we did serve may have come from a Tampa Bay area supermarket chain, Sweet Bay, but we consider them the equal of the very best sausages we’ve ever had—in Italy and from artisan butchers in New England. In fact, we’ve written before about our fantasy of a kindly old Italian fellow dressed in a threadbare grey cardigan sweater going to Sweet Bay’s corporate kitchens once or twice a week to supervise the making of the sausage. Our lentils, cooked separately with bay leaves, garlic, and orange peel, finished in the pan with the sausages, were delicious. But with or without sausages, lentils carry the main message. So we hope all our readers have a happy, healthy year. May you and your loved ones share the abbondanza we wish for you in 2008. This entry was posted in Uncategorized and tagged Cotechino, Italian food, Italian immigrants, Italian traditions on January 2, 2008 by Skip.